Over the past decade, with the fall of communism, Russia has captured the imagination of many western travelers. Spanning two continents and eleven time zones, it is the world's largest country and a land of enormous variety. Arctic deserts and tundra cover much of the north; deep green forests and steppes stretch across the south. The majority of its people are Russian, but many minorities also live within its borders: Tatars, Ukrainians, Chuvash, Bashkir, Belarusians, and Mordvins, among others. The region between the Dniester and the Volga rivers — European Russia — has been inhabited by various people, including the Slavs. Kievan Rus, the first Slav state, emerged in the 10th century only to lose its supremacy to Novgorod and other independent states in the 11th and 12th centuries. In the 13th century, Russia was occupied by the Mongols. The princes of Moscow gradually overthrew the Mongols in a series of bloody uprisings during the 14th and 15th centuries. In the 16th century, Muscovy (Moscow) began to expand its territory in a drive that would continue through the reigns of both Peter the Great (1689-1725), and the equally powerful and enigmatic Catherine the Great (1762-96). In 1812, Russia was invaded by Napoleon. His defeat gave Russia most of the grand duchy of Warsaw. Later in the 19th century, Russia annexed Georgia, Armenia, and the Caucasus territories, making it the largest empire in the world. The turbulent overthrow of the tzarist regime, in 1917, after the February and October revolutions in St. Petersburg, marks the beginning of the Soviet era. The powerful communist regime that came to power would inevitably become the symbol of Russia for the next 70 years. Russia has been an independent country since the dissolution of the Soviet Union in December 1991. Since the majestic celebration of the 300th anniversary of St. Petersburg in 2003, Russia has welcomed a steady stream of tourists from all over the world. Founded in 1703 by Peter the Great and named after his patron saint, St. Petersburg was the capital of the Royal Russian Empire from 1712 to 1918. It is said that every sandstone block used in its construction was personally inspected by Peter the Great himself. Nothing can compare with the splendor of "White Nights" in St. Petersburg at the end of May. Standing on the Nevsky, overlooking the spectacular cathedrals and other monuments whose breathtaking facades glisten on the Neva River, one gets a sense of the luxurious, decadent, and yet very tragic history of this northern European capital. A night train ride from St. Petersburg — or Piter as the Russians call it — brings you to Moscow, the capital of modern Russia. Located on both sides of the Moskva River in western Russia, about 400 miles southeast of St. Petersburg, Moscow is the largest city in Russia. Moscow became the capital of the principality of Muscovy in the 13th century and remained the capital of Russia for almost two centuries (1547-1712). Moscow became the capital of the Union of Soviet Socialist Republics in 1918. In the years to come, it would stand as the ultimate symbol of communism. Even today, enfolded by the red walls of the Kremlin, one still feels the undeniable presence of something quite great and very prevailing. The spiritual home of the Russian Orthodox church for more than 600 years, Moscow is the political, industrial and cultural center of Russia. It is also a great metropolitan European city. 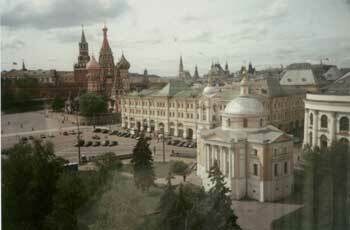 Moscow's most notable structure, the Kremlin — flanked by the Red Square along its eastern wall and dogged by St. Basil's Cathedral at the southern end of the square — is a breathtaking symbol of Old and New Russia. Moscow and St. Petersburg are favorite destinations, but there is an ancient part of Russia still unknown to many tourists — The Golden Ring of Russia. The Golden Ring is a chain of Russian cities to the northeast of Moscow that form a circle and "lock up" in the Russian capital. Magnificent churches and monasteries dating back to the 11th century can be found along the route. Often called Open Air Museums, these towns — Sergiev Posad, Suzdal, Vladimir, Rostov Veliky, Kazan, Novgorod, Kostoma, Tver, and Kizhi, among others — have withstood the power of time and stand today as evidence of an unforgettable and mysterious past.